Whether you plan on going into law enforcement, public policy or would like to become a lawyer, there are plenty of career options if you decide to obtain a criminal justice degree. 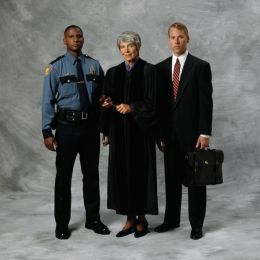 With a criminal justice degree, career options are vast and students will be exposed to a variety of topics and subjects that will prepare them for roles working inside the confines of the US Federal Government, state and local law enforcement agencies, courthouses, social service agencies and other major policy decision making bodies that require an understanding of the criminal justice system. Here is a quick overview of career options for those studying criminal justice. There has been a recent surge in law enforcement careers and a degree in criminal justice studies can prepare you for those careers. Law enforcement agencies are found at the city, county, state, national and international level. On the local level, cities and towns have major police departments and in order to move up the ranks, it is highly encouraged to have a bachelor’s degree or higher in a relevant field like criminal justice. At the national level, there are many federal law enforcement agencies that require individuals to have a bachelor’s degree and higher. These agencies include the Federal Bureau of Investigation (FBI), Central Intelligence Agency (CIA), the Department of Justice, Department of Homeland Security, the United States Marshals, the Secret Service and much more. At the international level, criminal justice majors can also land jobs working for the United National International Police as well as other major global law enforcement task forces. With a criminal justice background, you can definitely prepare yourself to go into law. Those with a criminal justice background can easily become defense attorneys, public defenders, prosecutors, judges and court clerks. Obviously, in order to become a lawyer or a practicing attorney, you would need to go to law school and get a juris doctorate. Law school takes three years to complete if you go to full-time and around four years to complete if you go part-time. You will then need to pass a state bar examination to legally practice law in the state in which you reside. Another option you can consider if you find interest in criminal law is to go into public policy and advocacy. There are major organizations that are dedicated to reasearch and analyzing trends related to law enforcement, drug policy, incarceration and policing. Individuals who have an interest in the data analytics side of criminal justice should consider getting a master’s degree in public policy and public administration to go hand in hand with a bachelor’s degree in criminal justice. This will give you the skills set and experience necessary to get into the more evaluation and data analysis-side of criminal justice. As you can see, there are many different angles you can take with your career if you decide to study criminal justice. Whether you see yourself working directly within law enforcement, the court system or working for a major advocacy and public policy group, there are many other career options to consider when decide to take up criminal justice while in school. Find what you are most passionate about and speak with your academic counselor about pursuing a criminal justice degree.